شعارات النبالة (بالإنجليزية: Heraldry) هي المهنة والدراسة، أو فن الابتكار والمنح، والأسلحة المزركشة وحكم الرتب أو البروتوكولات التي يهتم بإعطائها ضباط الأسلحة. أعلام النبلاء أو شعارات النبالة أتت من كلمة هيرالد (بالإنجليزية: herald) باللغة الأنجلو نورمانية الآتية من الجملة المركبة الجرمانية (harja-waldaz) والتي تعني قائد الجيش. الكلمة بمعناها الأعم تشمل كافة الأمور المتعلقة بواجبات ومسؤوليات ضباط السلاح. وعلم شعارات النبالة هو ممارسة تصميم ،عرض ،وصف وتسجيل شارات الأسلحة والدروع. Boutell, Rev. Charles. Boutell's Heraldry. John Brooke-Little, ed. London and New York: Frederick Warne, 1983. Burke, Sir Bernard. The General Armory of England, Scotland, Ireland and Wales; Comprising a Registry of Armorial Bearings from the Earliest to the Present Time. Baltimore: Genealogical Publishing Co., 1967. Elvins, Mark Turnham. Cardinals and Heraldry. London: Buckland Publications, 1988. Fairbairn, James. Fairbairn's Crests of the Families of Great Britain & Ireland. New York: Bonanza Books, 1986. آرثر ديفيز [لغات أخرى]. The Art of Heraldry: An Encyclopedia of Armory. Fox-Davies, Arthur Charles and Graham Johnston. A Complete Guide to Heraldry. London: TC & EC Jack, 1909. Humphery-Smith, Cecil. General Armory Two. London: Tabard Press, 1973. Innes of Edingight, Malcolm. Scots Heraldry. Third ed. London: Johnston & Bacon, 1978. Le Févre, Jean. A European Armorial: An Armorial of Knights of the Golden Fleece and 15th Century Europe. Eds. Pinches and Anthony Wood. London: Heraldry Today, 1971. Louda, Jiří and Michael Maclagan. 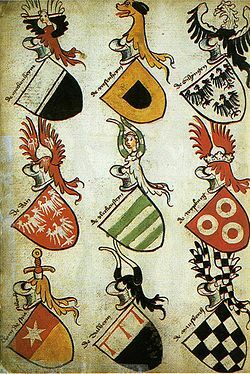 Heraldry of the Royal Families of Europe. New York: Clarkson Potter, 1981. Mackenzie of Rosehaugh, G. Scotland's Herauldrie: the Science of Herauldrie treated as a part of the Civil law and Law of Nations. Edinburgh: Heir of Andrew Anderson, 1680. Moncreiffe of Easter Moncrieffe, Iain and Don Pottinger. Simple Heraldry - Cheerfully Illustrated. London and Edinburgh: Thomas Nelson and Sons, 1953. Neubecker, Ottfried. Heraldry: Sources, Symbols and Meaning. Maidenhead, England: McGraw-Hill, 1976. Nisbet, Alexander. A system of Heraldry. Edinburgh: T & A Constable, 1984. Parker, James. A Glossary of Terms Used in Heraldry. Newton Abbot: David & Charles, 1970. Paul, James Balfour. An Ordinary of Arms Contained in the Public Register of All Arms and Bearings in Scotland. Edinburgh: W. Green & Sons, 1903. Reid of Robertland, David and Vivien Wilson. An Ordinary of Arms. Second vol. Edinburgh: Lyon Office, 1977. Rietstap, Johannes B. Armorial General. Baltimore: Genealogical Publishing Co., 1967. أنتوني فاغنر. Heralds of England: A History of the Office and College of Arms. London: Her Majesty's Stationery Office, 1967. Woodcock, Thomas and John Martin Robinson. The Oxford Guide to Heraldry. New York: Oxford University Press, 1988. ↑ أ ب ت American Heritage Dictionary of the English Language (الطبعة 4th). Boston: Houghton Mifflin Company. 2000. ISBN 0618082301. الوسيط |مكان= تم تجاهله (مساعدة); الوسيط |الإصدار= تم تجاهله (مساعدة); الوسيط |الرقم المعياري= تم تجاهله (مساعدة); الوسيط |العنوان= تم تجاهله (مساعدة); الوسيط |الناشر= تم تجاهله (مساعدة) وسم <ref> غير صالح؛ الاسم "AHD" معرف أكثر من مرة بمحتويات مختلفة.